• What About Ivanka's Shoes? In 1938, British Prime Minister Neville Chamberlain had a meeting with German dictator Adolf Hitler at which they discussed Hitler's treaty violations and his aggressive behavior, most obviously the invasion and annexation of Austria and part of Czechoslovakia. At that meeting, Hitler promised—cross his heart, hope to die—that he was done building and testing nuclear weapons. Oops, wait. No, he promised he was done invading and annexing other countries. The führer even agreed to sign a piece of paper affirming that promise. Delighted, Chamberlain returned to his home country and proclaimed that he had secured "peace for our time." We all know that Chamberlain's declaration was just a tad bit...premature, a mistake that cost him his premiership. And now, what is unfolding between the United States and North Korea is following an awfully similar script. Kim Jong-Un was full of charm and cooperative verbiage during his meeting with Donald Trump a month ago, so much so that Trump declared that the nuclear threat was over. Then we learned that Kim almost certainly has secret nuclear weapons and test sites that he has hidden from the United States and has no intention of giving up. Still, the U.S. soldiered on, with Secretary of State Mike Pompeo engaging in two days of negotiations with the North Koreans, and on Friday announcing that "progress" had been made. On Saturday, the North Koreans made clear that they do not agree, describing the negotiations as "regrettable" because of Pompeo's "gangster-like mindset." The Secretary quickly fired back, calling the attacks upon him "unfounded" and saying that, "If those requests were gangster-like, the world is a gangster." So, the war of words is underway (again). At this point, Trump has a tough choice to make. On one hand, like Chamberlain, Trump has hitched his wagon to the idea that he will be able to make peace with his adversary (though in Chamberlain's case, there wasn't nearly so long a history of bad faith for him to be wary about, whereas the Kims have been pulling this nonsense for generations). So, the President really needs to make this work out, and to keep the negotiations going. On the other hand, Kim is clearly testing Trump's limits to see what he can get away with, and to find out if Trump really meant it when he said that this was North Korea's "only" chance. Since Kim only responds to chest-thumping, the President really needs to tell him that he's blown his shot, and that the time for talk is over. Anything else will telegraph weakness, and will encourage further bad behavior by Kim. Needless to say, Team Trump cannot simultaneously keep negotiating and at the same time end negotiations, so he's put himself into a lose-lose scenario. Tomorrow, Donald Trump is set to announce his pick to replace Anthony Kennedy on the Supreme Court. The President doesn't always abide by his self-imposed deadlines, but given that he is leaving for Europe on Tuesday, the odds are high he makes this one. Consequently, he is spending a great deal of time between golf games this weekend evaluating possible picks. The general consensus says that the current frontrunner is Raymond Kethledge, who is 51 years old and something of an Antonin Scalia clone. Kethledge is being pushed hard by Senate Majority Leader Mitch McConnell (R-KY), who says that he (or Thomas Hardiman) will be easiest to confirm. This is reportedly a major selling point for Trump, who does not want the embarrassment of a failed nominee. The President is also impressed by Kethledge's skills as an author, which are generally regarded to be the strongest among the folks currently under consideration. Meanwhile, previous frontrunners have fallen back to the pack, for various reasons. Amy Coney Barrett may be a little too right wing, and McConnell says she could well fail to get the votes of Sens. Lisa Murkowski (R-AK) and Susan Collins (R-ME). Brett Kavanaugh's work as part of Kenneth Starr's team, and then his long tenure on the bench, mean that he's produced literally hundreds of thousands of pages of controversial opinions that the opposition could weaponize. Similarly, Thomas Hardiman is a Second Amendment zealot, and has said some things on that subject that will thrill the base, but that could come back to haunt Trump during the confirmation process and/or the midterms. With that said, this trio is still regarded as being "on the list," just not in first position right now. Late Saturday afternoon—a scheduling choice that just screams "we're trying to slide this in under the radar"—the Trump administration announced that it would cease payments being made under the ACA's risk adjustment program. In short, under the terms of the law, every insured person pays into a pool of money that is set aside. Then, according to a complicated formula, that money is distributed to the insurers who incurred unexpectedly high costs in covering high-risk patients in the past year. While many parts of the ACA grant the president and/or the Dept. of Health and Human Services wide discretion, this is not one of them. The payments—and it is over $10 billion that will be withheld—are mandatory. The administration is using a legal dispute over the payment formula—which a federal judge in Massachusetts said was ok, but a federal judge in New Mexico said was not—as cover for flouting the law. Not the ones she's wearing. The ones that are sold under her name, and are made in China. Assuming Donald Trump really sticks with his tariffs and his trade war, then people are going to examine very carefully which products are targeted and which ones are not. This, in turn, will create controversy and headaches that Team Trump has not yet begun to imagine. And already, folks have taken notice that one of the products that has been exempted from duties is shoes. Kansas State Sen. Steve Fitzgerald (R) is running in the GOP primary for Rep. Lynn Jenkins' (R) soon-to-be-vacated seat. And on Friday, in a speech that was open to the general public, Fitzgerald let loose with some rather choice opinions. Among them, that "Christendom is under attack," that Planned Parenthood is more genocidal than a German concentration camp, and that, "outside of Western civilization there is only barbarism." This is, of course, just one candidate in one Congressional district. However, he's got a legitimate chance to win the GOP nomination for a seat the the Democrats think they can flip. And this story brings up two interesting issues that haven't got a lot of attention this election season. The first is that there has been a lot of focus on the progressive-centrist divide on the Democratic side, and the possibility that the blue team might nominate candidates that are too far-left for their districts. But maybe this is a dynamic that the GOP ought to be worrying about, too. That is to say, it is plausible that a candidate like Fitzgerald, with his ultra-Trumpian rhetoric, could capture half the GOP primary vote, but then might be unelectable, particularly if up against a moderate Democrat. A new Washington Post-Schar School poll is out, and it's a very good one. That is to say, they've attempted to tease out some of the key issues in the midterm elections in a way that most other polls do not, focusing not only on key issues, but also on battleground vs. non-battleground districts. Americans trust Trump more on border security than they do the Democrats (37%-27%). In battleground districts, the skew in Trump's favor is even greater (42%-25%). More Americans approve of Trump's handling of the economy than disapprove (50%-48%). Only 14% of Americans think that restricting guns is the most important issue in the midterms. Only 37% of Americans think Trump is solely to blame for family separations (35% blame the parents, and 25% blame both Trump and the parents). Though Trump does better on border security, Democrats do better on immigration overall (38%-30%). Only 32% of American women approve of Trump. Only 6% of Americans accept Trump's argument that undocumented immigrants are mostly gang members. Only 8% of Americans think that taxes/the GOP tax bill are the most important issue in the midterms. 48% of Americans think Trump is doing damage to American values. 66% of Americans think Trump lies a lot, and half of those think he hardly ever tells the truth. "Generic Democrat" now has a two-digit advantage over "Generic Republican" for Congress (47%-37%). Battleground district Democrats are more likely than Republicans to think the midterms are important (59%-46%). 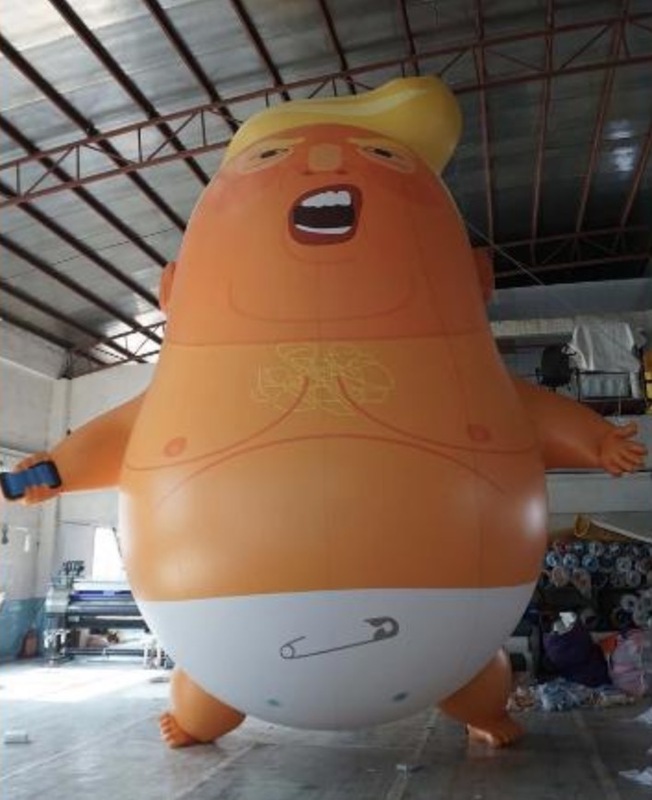 The protesters behind the balloon argue that it reflects the essence of the man: "An angry baby with a fragile ego and small hands."